The "Average, Everyday Housewife" - No Higher Calling! Will positions in God's Kingdom be based on the jobs individuals hold in this life? How do we qualify for rulership in the world tomorrow? Should we assume the top leadership positions in God's Kingdom will be occupied only by those who were men in this human life? Will women be eternally relegated to the lowest, least important jobs? 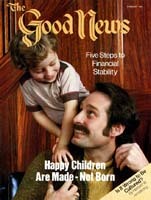 A few months ago in The Good News (June-July, 1980), we showed from the Bible that men and women all have the same opportunity. All who overcome will be given eternal life and the positions for which they qualify as they overcome (Rev. 2:26, 3:21). After that article I received a letter from a young homemaker. She summarized the problem many American women face when they choose to stay home and be housewives. She wrote: "For a good while, I have wanted to write someone who would write an article about women's role. Why? Because of my particular situation. I am married, 28 years old, no children as yet, and have attended God's Church since I was 12. The problem? I am continually asked if I work. When I reply that no, I don't, a look of incredulity almost always spreads across the person's face, and then comes that inevitable question, 'What on earth do you do all day?'" Some people apparently think that homemakers just sit around all day watching soap operas, never bothering to get dressed or to get their hair out of curlers. This life is a training ground 'for ruling with Christ. Can an "average, every day, housewife" qualify for rulership over five cities, 10 cities or an entire nation in God's Kingdom (Luke 19:11-27)? Does any woman have cause to be ashamed if she is "just a housewife"? As we discussed in the last article, God did not create women as some sort of afterthought — a last minute "Whoops! I almost forgot." The creation of women was an integral part of God's plan. Mankind was not complete with the creation of the male only (Gen. 2:18). So God made Eve, from the rib of Adam, to be his perfect companion and complete spiritual equal. But how do women qualify for rulership? Just like men. First and foremost, what each of us does most to qualify for God's Kingdom is to develop holy, righteous, godlike character. Character is the one thing God cannot create instantaneously, by fiat. Character transcends this physical life — physical things don't. No. Not because he could jump high in this physical life. All spirit beings can most likely jump 7 feet 8 inches and much more with ease, Qualification to rule does not depend on how much we train ourselves in a physical way. Character is what carries over to spirit life. The day-to-day events of life constantly provide opportunities to develop 'character. From our decision to get up in the morning through the decisions we make all day to our decision to retire at night, character is being developed — righteous or unrighteous, whichever is the case. In addition to the daily character-building process, no doubt a direct correlation exists between all of our life experiences and our ultimate potential to serve in God's government. We can't just sit around and do nothing and expect that 10 cities will be laid in our laps at the return of Christ. We have to be prepared. But in these articles on husbands, wives and the family we are attempting to show that one kind of lifestyle or profession, or whether we are male or. female, has little to do with the positions we attain in God's Kingdom. Some might feel the president of a multimillion-dollar corporation would automatically have a greater reward in the Kingdom than a carpenter. Why? Well, because of all the decisions the president has to make and his complicated daily routine. Not necessarily. That corporate president may not have come close to developing godly character. Maybe he fought his way to the top in the competitive corporate structure and developed no godly character at all in the process. On the other hand, the carpenter may have developed love, self-control and reverence for God through his experiences. The carpenter would be well suited to rule in the Kingdom, while the corporate executive may not even be in the first resurrection. Where such a modern wonder woman exists, I don't know. But we have been made to believe that this is what a woman should be. But how do women qualify for rulership? Just like men.... what each of us does most... is to develop holy, righteous, godlike character. Character is the one thing God cannot create instantaneously, by fiat. Character transcends this physical life — physical things don't. No one ever said mopping floors was fun. Cleaning the toilet bowl is not a tremendous challenge. Soaking a tubful of dirty diapers really doesn't make the day. And many a mother, wife and homemaker who devotes her full time to taking care of the home might wonder what a hot stove, dirty floor or unmade bed have to do with making it into God's Kingdom. But the effective management of the home has just as much to do with learning to rule as any other job any other person could have. Running a home is in many respects like managing a corporation. Let's look at the similarities. We think of several things when we hear the word executive. Somehow that word smacks of success. We think of tall buildings, suites of offices, financial wealth. We visualize such top-level managers living in exclusive suburbs and driving late-model cars larger and more expensive than the rest of us can afford. We see them, in our mind's eye, making decisions, talking on the telephone, holding important meetings, going to lunch at the best restaurants. And we are tempted to think of how well qualified they are — how much more important than we are. We probably think such a person would be much more qualified to rule 10 cities in the world tomorrow, certainly more qualified than the "common housewife:" But are the jobs really that different? What are some of the things executives do? One area is that of time scheduling. The effective executive knows how to get things done. He makes sure the business meets its deadlines. He has to deliver as promised. Executives make multiple decisions daily, and these decisions have to be the best and wisest ones possible. And then executives have to delegate. No one person can do it all. The effective executive 'knows how to give tasks to others who can handle the job. Read Proverbs 31:10-31! These verses describe an ideal executive manager, a person who scheduled time, made decisions, solved problems, was responsible over others and delegated work — and was very successful at it. Who was this person? A homemaker — the virtuous woman! The writer probably knew one or more women who were setting examples such as he described. The virtuous, woman made a profession of caring for her household the best way possible — she was much more than the false image society has of housewives today. "Give her of the fruit of her hands; and let her own works praise her in the gates" (verse 31). There it is. Her outstanding example was recorded for posterity in God's Word. An effective homemaker employs everyone of the tools of effective management. She is developing the qualities needed to direct cities and nations in the world tomorrow, just as much as anyone else is. Frankly, when you understand the job of the homemaker — the wife and mother — you might wonder if it does not present one of the greatest opportunities for skill development. Take time and scheduling, for example. A major manufacturer may have huge, impressive-looking charts and graphs showing corporate production schedules. How all the parts that go into a car get into the new car you order is a modern production miracle. But it only took time and scheduling. The homemaker gets the family off to school and work, well fed and clothed, does the shopping, pays the utility bill, meets the kids when they return from school, takes Susie to the orthodontist and Jimmy to the YOU basketball practice. She has dinner ready in the evening and during her "extra time" cleans the windows, strips the wax from the kitchen floor, calls the repairman to fix the washing machine, makes an appointment for counseling about her children at school, visits ailing Mrs. Smith and drops by the post office on the way home. Have you men reading this article ever stopped to think about how much a wife — a homemaker — has to do? Running a smooth-flowing household takes the skill of a corporate president and then some. And that is the same skill it will take to be over several cities in God's Kingdom. But she has to be an efficiency expert as well. She has to consider the cost of gasoline to get to all the stores and the time it takes to shop. Decisions have to be made. If she really is an effective executive she will get the shopping done at the best prices and gel other things done too. As dean of students at Ambassador College, I was often amused — even shocked a few times — when, over the years, some students would come to college not even knowing how to make a bed. Mom had always done it for them. Some students literally did not know how to operate the college's washers and dryers. And many did not know how to put in an honest, full day's work. Let's go through a typical example. It's time for spring cleaning in your home. The first order of business is to decide which parts of the job can be delegated. For example, your teenage son can dismantle the bed and take it out of the room. The girls can empty their own drawers, but maybe they are not big enough to put the new shelf paper in — you'll want to do that. So you make a schedule of who will do what jobs. Be sure you match the proper job to the proper person. Heavy lifting cannot be done by small children. Set realistic goals for them. Put the kids on a time schedule. Give them 45 minutes, for instance, to put everything from the dresser drawers into the cardboard boxes and to set aside everything they want to throw away. You can now go to another part of the house for 45 minutes and need only to check on their progress once or twice. If you adopt such a plan to get a room clean several things will be accomplished. The room will get cleaned. The children will share in the responsibility. You will get another job done. You will have applied the tools of effective management. And you will have developed skills that will be used in ruling with Christ in the world tomorrow. The woman who decides to be a homemaker is choosing as high an occupation as it is possible to choose. No corporate executive, great financier, famous entertainer or sports personality has a greater calling or profession. It's time we all realized that. The training of the homemaker prepares her for the Kingdom of God just as other people's jobs prepare them. God has not established an elitist system of "better" jobs and "lesser" jobs. God does not look down on the janitor, laborer, farmer or housewife, while he looks up to the doctor, lawyer or banker. Human societies established hierarchies of respect — class systems. Some professions seem to carry greater honor - certainly they carry higher financial rewards. But no profession will carry more social status than any other in God's Kingdom. This does not mean a pseudocommunistic state will exist. God's Word is clear that some individuals will work harder and grow spiritually stronger than others in this life; those who do will qualify for greater rewards. But the development of character has little to do with what job you occupy now. But, partially because of the modern feminist movement, the role of homemaker and housewife has been relegated to practically the bottom rung on the ladder of respect in this, age. Women have been made to feel that if they are not in the battle for top executive jobs in the professions, they are not fulfilling their potential and aren't worth much. An effective homemaker... is developing the qualities needed to direct cities and nations in the world tomorrow, just as much as anyone else is. Frankly" when you understand the job of the homemaker... you might just wonder if it does not present one of the greatest opportunities for skill development. I may not win a popularity contest with the women's liberation movement, but that remains the truth. On the other hand, neither should men try to subordinate and suppress women — keep them "barefoot and pregnant" — while men go out and play the big shots. God's Word is clear about the roles of men and women. They are both made in the image of God and are equal (Gen. 1:27), and in marriage each has particular responsibilities (Eph. 5:21-33). Husbands are to love their wives as Christ loved the Church (verse 25), and that includes appreciating them — treating them with proper respect, "as being heirs together of the grace of life" (I Pet. 3:7). My wife holds a college degree and taught school for two years before our marriage. I consider her an extremely capable woman. But when we married more than 20 years ago, she began to devote all her talents and efforts to being a homemaker — a wife and mother. We have had five children, two of them now in college, and it has taken her full time to fulfill her role and responsibility. She has been developing the skills to qualify her every bit for the position she will be given in God's Kingdom, if she continues to grow and overcome and is privileged to be born into the Family of God at the return of Christ. The quality that carries over to the Kingdom -from this physical life is character. As Herbert W. Arm' strong has often stated, God will not save anyone He cannot rule. The test of character in this life is the development of faith and obedience. Any profession — laborer, executive or homemaker — has built into it the training necessary in preparation for spiritual responsibility in the world tomorrow. Then, unlimited power will be given to those who are changed to immortal beings. Housewives train just as much in the character-developing process. Positions of rulership are not passed out based on how many dollars one controlled or how many employees over which one had authority, but rather on what kind of overcoming one does — on how well one does with what he or she has to do with. God has, in His infinite wisdom, provided the means and opportunity in this lifetime for training and character development for all people whom He calls. It is God's desire and His will for us to be saved. Male and female are terms that apply to this physical life. In the Kingdom we neither marry nor are given in marriage (Matt. 22:30). Resurrected from the dead and changed from mortal to immortal, we shall all serve with Christ, ruling with Him for a thousand years and then fulfilling our destinies for eternity. We have by no means exhausted this subject, so important to this physical life. There is much yet to be said about husbands, wives and the family. Next time we will analyze the qualities of the "perfect wife." You might be surprised at what the Bible has to say about homemaking and motherhood.